WASHINGTON—Citing exhaustion, an overcrowded field of candidates, and little hope of making a difference in 2008, roughly 300 million Americans announced Tuesday that they will be leaving the presidential race behind. The U.S. populace, which has participated in every national election since 1789, said that while the decision to abandon next year's race was difficult, recent events, such as disappointing victories by both Sen. Hillary Clinton (D-NY) and former New York City mayor Rudolph Giuliani in regional straw polls, left them with no real choice. "We gave it our best shot, and for a while it seemed like the American people actually had a chance of coming out on top," Weare, NH resident Mark Simmons said at a press conference in front of his suburban home. "Unfortunately, as much as we'd like to remain optimistic, it's become clear that this just isn't our year." Added Simmons: "Maybe you'll see us again in 2012." Though initially excited about making universal health care a reality and putting an end to the Iraq war, the American people appeared visibly worn down after only three months of campaigning. According to Beltway observers, idealism among Americans began to fade after the first series of major televised debates in August, during which every citizen in every state realized they would have to compromise their core values in order to remain in the race. 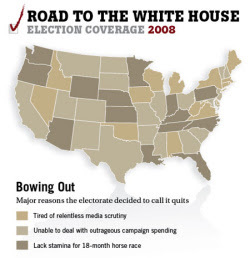 Factors including intense media coverage of seemingly trivial issues, destructive partisan bickering, and the relentless exploitation of 9/11 only seemed to further discourage Americans from making it to Election Day. "As the obvious underdogs, we knew that the chance of Americans winning in 2008 was slim to none," said Seattle native Paul Waverchuck, who claimed he was looking forward to spending more time with his family after giving up politics. "I guess there's just no room at the table for the vast majority of this country's citizens." 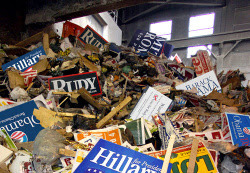 Some pundits predicted months ago that U.S. citizens would lose steam before the first round of primaries in January. Unable to endure the breakneck pace of morning talk-show interviews and the constant coverage and scrutiny of Hillary Clinton's laugh, Americans reportedly began to lose focus as early as mid-September. A strong October surge in several states by Republican candidate and Mormon Mitt Romney made it clear to thousands that it was time to throw in the towel. "Once Law & Order star Fred Thompson declared his candidacy and Barack Obama started using religion to win votes, you could tell America's heart wasn't in it anymore," Washington Post correspondent Dan Balz said. "They knew it was over for them." While not necessarily shocked by the news, some political observers have lamented the recent departure of the nation's citizens from the 2008 elections. "American men and women were the only real opposition to frontrunners like Clinton and Giuliani," New York Times columnist Maureen Dowd said. "They were the only ones who seemed to have the public's best interest truly in mind. Without them, it's not going to be much of a contest." While admitting to being disappointed by the results, Americans said they would continue to pursue lasting social change, whether by working overtime shifts in order to make education more affordable for their children, or by selling some of their belongings in order to provide medical coverage for aging family members. "Politics are all well and good, but sometimes you have to look for solutions outside of Washington if you want to get things done," said Henrietta Tanner, a single mother of three from Boise, ID. "Like standing in line at the food bank down on Cavendish Avenue, for instance." Japan’s Lunar Probe: HD Moon Photos & Movies! Baby, It's COLD in Here! No More Fried Food For Us!! !